Advance Tabco CRD-12 Stainless Steel Free-Standing Bar Drainboard - 12" x 21"
Prep all your favorite beverages and more with this Advance Tabco CRD-12 stainless steel free-standing bar drainboard. An embossed and seamless drainboard boasts a 1" IPS drain, and is fitted with a 4" backsplash. Both features serve to keep users safe by reducing the potential for wet, slippery surfaces immediately around the unit, which ensures a safe and comfortable environment for your bar staff. This drainboard is designed for exceptional durability and years of high volume use thanks to sturdy construction along with adjustable side cross-bracing. 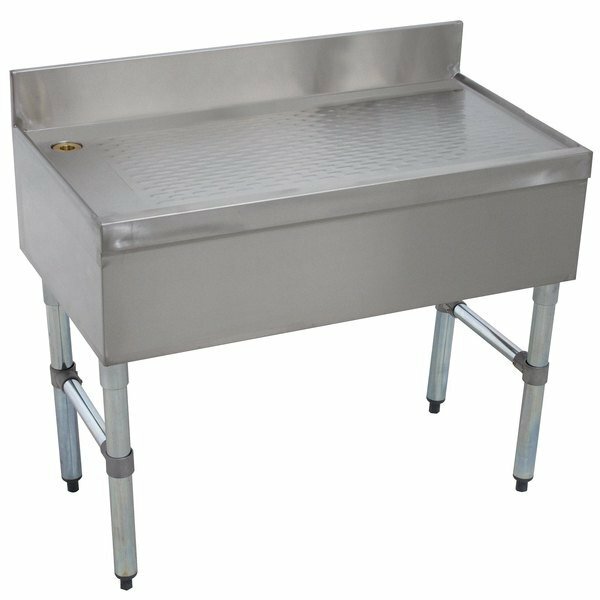 For added storage, this series of drainboards has an integrated rear deck. The Advance Tabco CRD-12 free-standing drainboard is the perfect addition to any commercial kitchen or foodservice operation.